May 1, 2019: Ladies Meeting cancelled until May 8. May 8, 2019: Ladies Tea @ 12:30. The public is invited. Breakfast each Saturday morning at 9:00 a.m. Please join us! 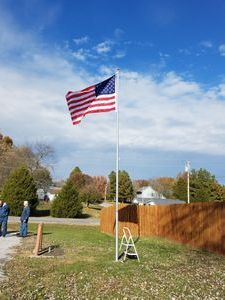 Our new flagpole and flag was dedicated on Veterans Day, 2018, during the Association’s Veteran’s appreciation party. Approximately 40 Vets were in attendance to partake in the festivities. We thank the Goreville Boy Scouts Honor Guard who presented and raised the flag and those who contributed to the purchase of the flagpole. Because of the donations, the Association paid only $35.00 for the new flag and pole. We also would like to thank Chuck Vanseghi for installing the pole. Many thanks to the Ladies Group for hosting this annual event! Click here for the April EPBA Newsletter. prizes. The competition for best Irish Stew was won by Sharon Hughes! On Wednesday, April 10, the EPB Ladies Group hosted health professionals from the area who spoke on different topics. This event began at 9:00 a.m. and included a healthy lunch. Both the St. Patrick’s Day Party, and the Health Day are free events for all residents of Eagle Point Bay. This is the second year for both of these events and the Ladies Group is looking forward to an even bigger audiences this year. A severe storm passed through our area on June 28, 2018. Damages varied, from uprooted trees (below) to overturned floating docks. Let this be a reminder to everyone to clearly label your property with your subdivision number and lot number. Eagle Point Bay is Subdivision number 14. If you own lot 271, then your property should be labeled: 14-271. SIPC recommends labeling anything that can blow or float away, such as boats, docks, floats, chairs, life jackets, etc. This will help protect your property in the event of another such storm! - be approved by the Board. Click here for a complete copy of the Building Use Policy. It is a .pdf document and may be downloaded. Or visit the Association Building on most Saturday mornings between 9 and 11 o'clock. 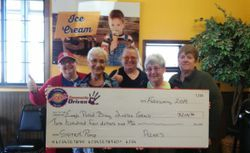 The Eagle Point Bay Ladies Group was the reciprient of Acee's Spirit Pump proceeds from January, 2019. Thanks to Acee's for their community spirit! The Eagle Point Bay Association is a not-for-profit organization that represents the common interests of its membership. Members must be property owners in the Eagle Point Bay subdivision located in Johnson County, Illinois, on Lake of Egypt Southern Illinois. The Association plans and implements activities related to the health, safety, and quality of life of its members and strives to promote a sense of community spirit among all residents and property owners in Eagle Point Bay. Not a member? Please join us to help us improve our community and gain access to our parks and boat launch. Click here to download a Membership Application or visit our meeting place below on Saturday morning to join. Visit our Calendar page to view Upcoming Events.